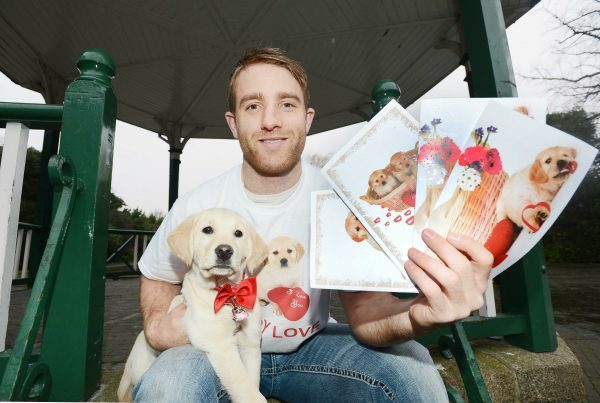 Rugby star Luke Fitzgerald is asking you to spread some Puppy Love this Valentine’s Day by purchasing cards and gifts for your loved one from Irish Guide Dogs for the Blind. Irish Guide Dogs for the Blind have a range of gifts and cards for you to spoil your special someone. Gift options range from €12 to €50 and include cuddly teddies, gift bags, leads and collar sets and cards. Valentine’s cards feature images of adorable puppies who will go on to become future Guide and Assistance Dogs, helping people who are blind or vision impaired and families of children with autism. This campaign will benefit Irish Guide Dogs for the Blind puppy in training programme helping turn more puppies into heroes. Rugby star Luke Fitzgerald is pictured with puppy in training Harp and a selection of Irish Guide Dogs for the Blind Valentine's cards. Puppy Love is for everyone this Valentine’s. If you don’t have a significant other this Valentine’s, you can let a puppy be your Valentine. Purchase a gift for a puppy in training this Valentine’s Day; much needed gifts include a new bed, a fluffy fleece set or a grooming kit, visitwww.guidedogs.ie to make your purchase. Purchase your card and gifts online today and you will be spreading some Puppy Love to the ones you love as well as helping Irish Guide Dogs for the Blind to continue to provide mobility and independence.